Mobike announced yesterday (in Chinese) that their app will now include the option to ride for hongbao (红包 or “red envelopes” in English). 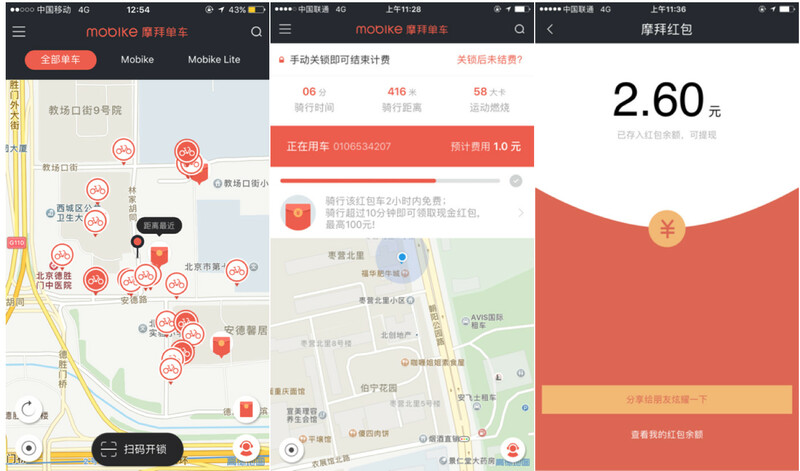 Similar to Pokemon GO, users can “hunt” for Mobike red envelope bikes (摩拜红包车). After riding one of the “Bonus Bikes,” as the company calls them, for at least 10 minutes, users are then eligible for two rewards: a free ride if under 2 hours and the chance to open a hongbao worth between RMB 1 and RMB 100. With no limits on how often a user can receive a hongbao, the funds received from the hongbao will be separate from the regular Mobike account. In addition, any hongbao balance greater than RMB 10 received from the can be transferred to the user’s Alipay account. The company says that they plan to add a WeChat transfer option in the near future. The Bonus Bikes are currently available in Beijing, Shanghai, Guangzhou, Shenzhen, Chengdu, Nanjing and more, and will be rolled out in the next few days to all the 33 cities across China in which Mobike operates. The move is unexpected and yet not surprising. 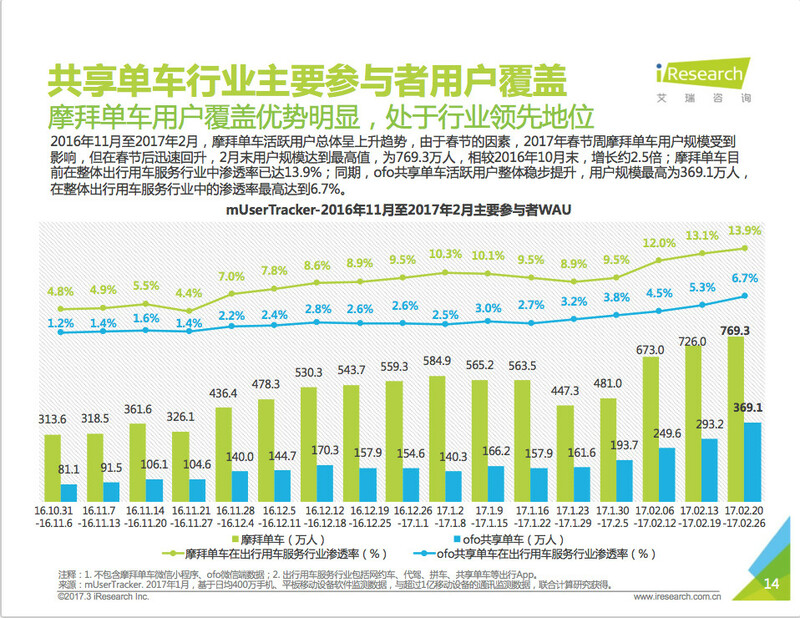 Both Mobike and competitor ofo claim to be the #1 bike-rental platform, but the jury is out: some 3rd party data shows that ofo is leading in overall market share while other’s (shown below) show that Mobike is clearly ahead; the Shanghai government claims that Mobike has more bikes on the road. And hongbao are a proven way to get more users. This year, without any marketing, WeChat was able to beat out rival Alipay and cousin QQ with 14.2 billion red envelopes sent out over New Year’s Eve. Indeed, not only was WeChat the first to introduce digital red envelope, but they did so to attract more users to their payment service. Combined across WeChat, TenPay, QQ, Tencent now boasts 600 million registered users for its payment services. Whether for defense or offense, Mobike is clearly hoping that gamifying their platform will help fend off other players and allow them to better Both companies are following the now-typical pattern for potentially huge markets: lowering barriers to entry and buying users through free or cheaper service. Historically, this has continued until the company goes out of business, gets bought, or becomes the dominant player. In the case of bike-rental, it’s still too early to tell. 16:20 March 24, 2017: This post was updated to include comments from Mobike, screenshots of the new function, and clarify some data about market share.